A Timely File You must view! Give it time to download. Submit your Family Group Sheet! Link Page ILLINOIS STATE and Co. This bullentin board is used for information about my pages only. It is not to post general information for others. If you have a problem contacting me PLEASE check this page. It will be used to post special bulletins. If you have any additions or corrections to this list, please send email to Don E. Wright with CLINTON COUNTY as the subject. "THE CARMI TIMES and CHARLENE SHIELDS"
If you own any published genealogical resources relating to Clinton County and would be willing to do lookups, please send me an e-mail message with Clinton Co, IL in the subject line; in the message, please list the publication title, author, publication date and your e-mail address. ....A small group of genealogists organized the Illinois comprehensive Genealogy Database. 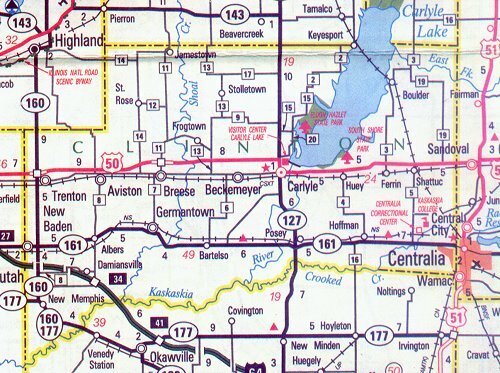 The idea was to provide a single entry point for all counties in Illinois, where collected databases would be stored. In addition, the databases would be indexed and cross-linked, so that even if an individual were found in more than one county, they could be located in the index.